Once upon a time, dance performances were set to live music. Even dance classes for children sported a live pianist. Sadly, in recent times it has become more and more common for performances of major modern dance companies to be set to recorded music. “L’Allegro, il Penseroso ed il Moderato” was accompanied by the Los Angeles Opera Orchestra, the Los Angeles Opera Chorus, and four superb operatic soloists (sopranos Hei-Kyung Hong and Sarah Coburn, tenor Barry Banks, and bass-baritone John Relyea); reason enough to go see Morris’ iconic work. It was an all-encompassing evening. Handel created his ode/oratorio to an adapted libretto composed of intertwined works by John Milton. Because Milton wrote in English, no supertitles are shown, though a copy of the libretto is in the program. How useful was this? Well, it is not really helpful, as the Dorothy Chandler was too dark to read along and doing so would put your focus improperly on the text rather than the dance. Supertitles would do the same. Anyway, the text itself is so dense it cannot be read casually; it could occupy several lectures in an advanced English lit course, without the distractions of music and dance. The libretto is impossible to understand when sung; fortunately it is not essential to the enjoyment of the dance. (Had I not known better, I think I would have assumed it was in German. Better to sit back and allow the production’s delights wash over you. In my opinion, discussions of the Mark Morris piece based on its connection to the text offer little illumination. The dance is supported by the music and the music is beautiful. “L’Allegro” is presented in two parts. Do not look for competing pas de deux; Morris’ choreography emphasizes the ensemble rather than having soloists as the focus. This is particularly evident in Part I. The company functions almost like a swarm of insects in a shifting breeze, undulating, dispersing, and coming together, separate beings moving as though they are an organic whole. The effect is charming with bits of gentle wit. The gracefully extended arms, simple flowing costumes, and luminous colors are bewitching … until they become a bit tedious. Morris’ palette of movement appears somewhat limited in Part I. Then Part II comes along.Here meaning is not so obscure. “L’Allegro” is in control. The dance is more spirited and muscular, the wit more prevalent. It shows up, for example, in dancers scurrying across stage animal like, on all fours. When dancers pair off, females may lift males, there may be male pairs or female pairs; it is of no consequence, as any dancer can take on almost any part. For virtually every moment the ensemble is foremost. Morris has often said that his choreography is not injurious to the dancers. Part II, in particular, clearly demonstrates that dance can be beautiful, muscular, and entertaining without rendering the dancers “old” well before turning 30. There is nothing cowardly in this choreography. “L’Allegro” ‘s spirit wins out. Significantly, the only line of the libretto that is intelligible, “Mirth, with thee we mean to live,” is the exuberant end to the performance. It is hard to imagine a better vehicle for Handel’s music than what the Los Angles Opera assembled in the pit. Associate Conductor Grant Gershon led a spirited, balanced, and stirring performance of the orchestra, chorus, and soloists. It would be hard to match. Luminous colors underlie Adrianne Lobel‘s simple but stunning set design. A series of changing scrims and frames create the effect of color-field paintings by Josef Albers or Mark Rothko, the latter in his pre-depression period. 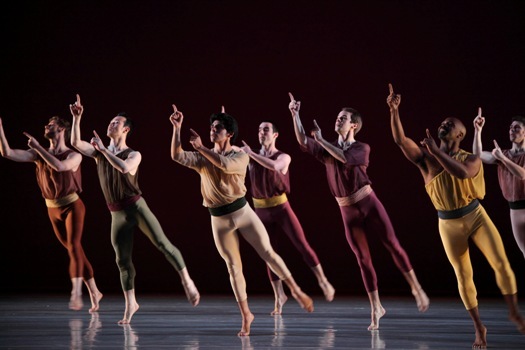 Christine Van Loon’s simple, flowing costumes of many colors complement both the dancers and the overall set design. Not only is the company an ensemble, but the staging, too, is a part of the ensemble at all times. Whatever its few shortcomings, “L’Allegro” is a fully satisfying performance. It is easy to see why it has become an icon of Morris’ work.